Hello Everyone! Finally, the weather is starting to warm up and we are so excited for spring. Spring not only means warmer weather but also a little spring cleaning, or in our case, spring redecorating. One of our FAVORite ways to freshen up a room is by adding a fantastic wallpaper. Wallpaper is great because it adds so much character to a space. Some people shy away from wallpaper because they think that it can make a look a room too loud, but it really is all about how you style it! Here are 15 of our favorite wallpapers that are worth looking into just in time for spring...and, sorry folks, this one is all for the little people. Subtle yet powerful, these "I will love you..." decals are a heartwarming addition to any nursery. The woodland trend meets the modern nursery with utter perfection. We also love that these wallpaper strips come in varying height options to perfectly fit any space. We can't get enough of the fabulous color combination in this Scandi-decor friendly pattern by Color Ray Decor...and did we mention we are obsessed with cacti patterns in general? Hands down, one of our favorite nursery wallpapers. 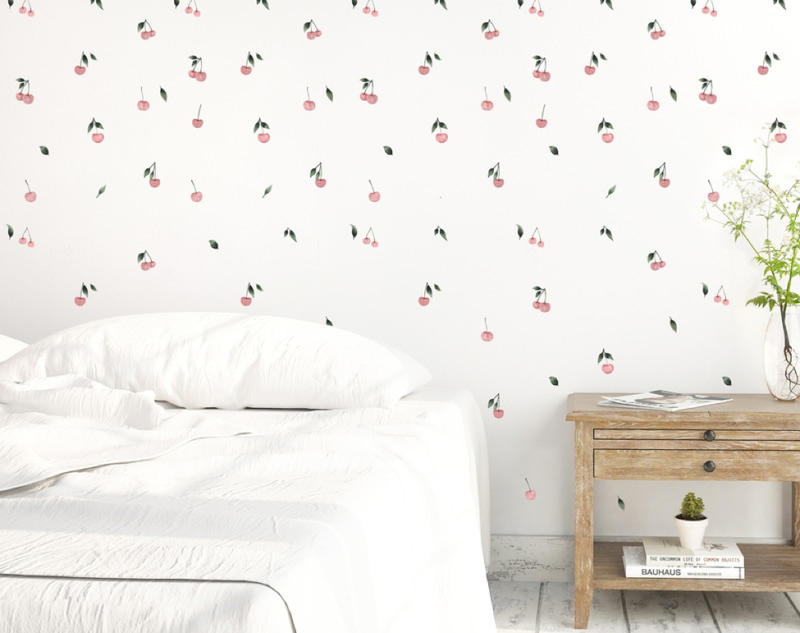 These darling wallpapers are the perfect balance of playful and sophisticated. A brilliant choice for both nurseries and children's rooms. Pair with light furniture for a truly stylish combination. Colorful, playful and inspiring. 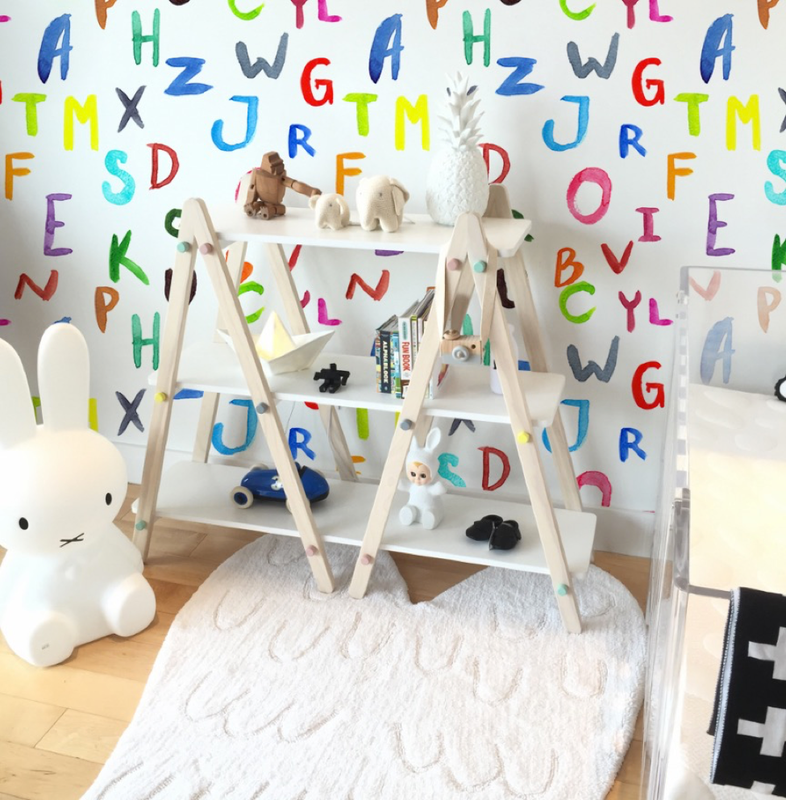 Feature this alphabet wallpaper on a book/art wall or, better yet, use it on all 4 walls to create the ultimate playroom! 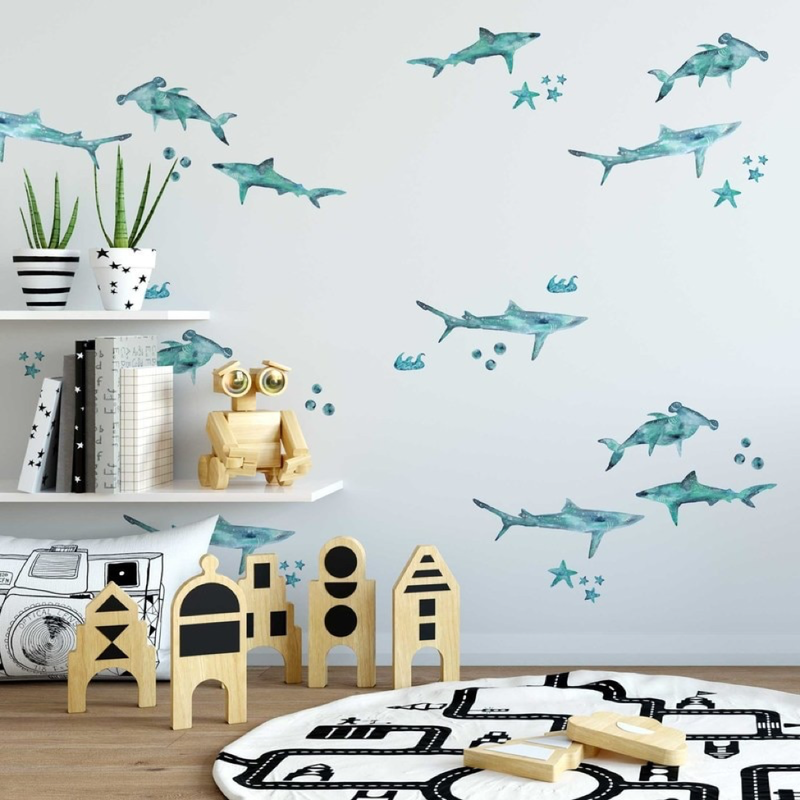 Turn the indoors into an ocean wonder and let their imagination run wild with these shark decals by Urban Walls Decals. Equally perfect in a playroom as they are in a bedroom. These Paris bubbles will effortlessly transition from a nursery to a little girl's and even teenager's room. In the prettiest shade of blush, they seamlessly work with any decor. This wallpaper is even MORE gorgeous in person. Pair it with simple furniture and let it speak for itself! Tres Chic! 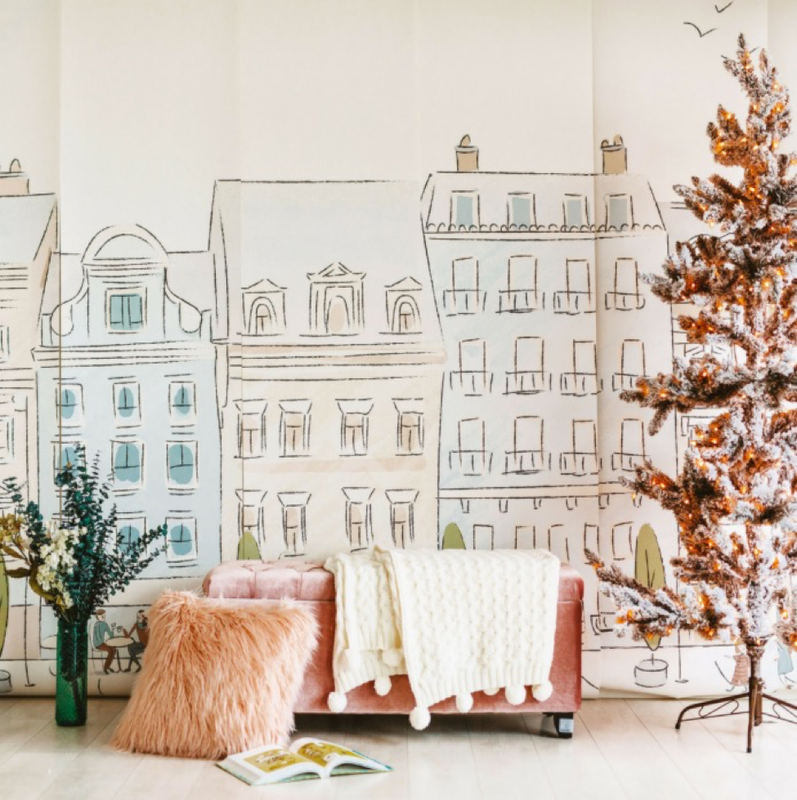 This Parisian street mural perfectly adorns any bedroom. Nestle a tea table and chairs along side for the perfect nook. Add a little extra love to your nursery with these hand drawn hearts. Simple and clean which is why we love. Funky wallpapers are perfect for adding life to any room. However, we love these comical moustaches for a playroom! 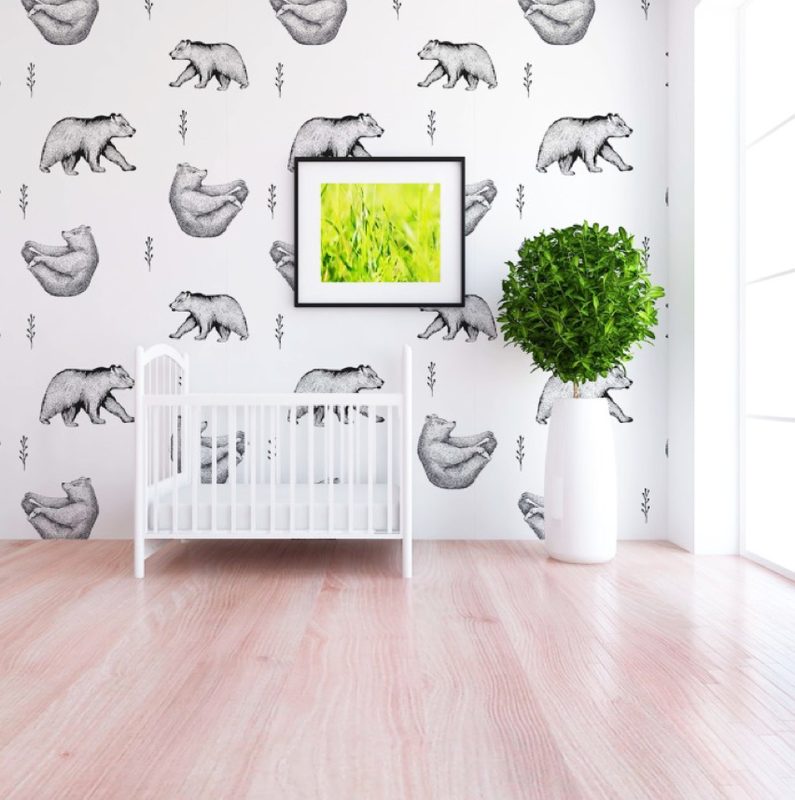 Let your child’s imagination run wild with this jungle inspired wallpaper. Scenic wallpapers are great for adding depth to any room and we are a huge fan of this one. Hi everyone! It's hard to believe that Thanksgiving is just a week away and, so, I wanted to put together some last minute decorating solutions. With all the cooking, prepping, organizing and more that takes place, many of you have expressed having no time left to decorate. In this blog, I have put together 10 inspirational photos of QUICK, EASY and clever ways to have Thanksgiving decor that is festive, refined and beautiful...and, more importantly, to do so without breaking a sweat. Here goes! 1.) Greet your guests with something festive as soon as they arrive to your door. 2.) Place white pumpkins on your steps. To achieve something clean and modern, simply place pumpkins in a straight ascending line. If they are large, place a pumpkin on every other step. For a more charming display, play with various pumpkin sizes and incorporate some candles. 3.) For a cheery effect, try incorporating fresh holly berries or cranberries along side white pumpkins and place everything on top of your mantle or any other surface that works. Use whatever glass containers you have and casually place the berries within. 4.) Create one beautiful display on your buffet. Make it an area where guests can snack on some nuts, pour a glass of wine, etc... and then scatter small white pumpkins throughout. 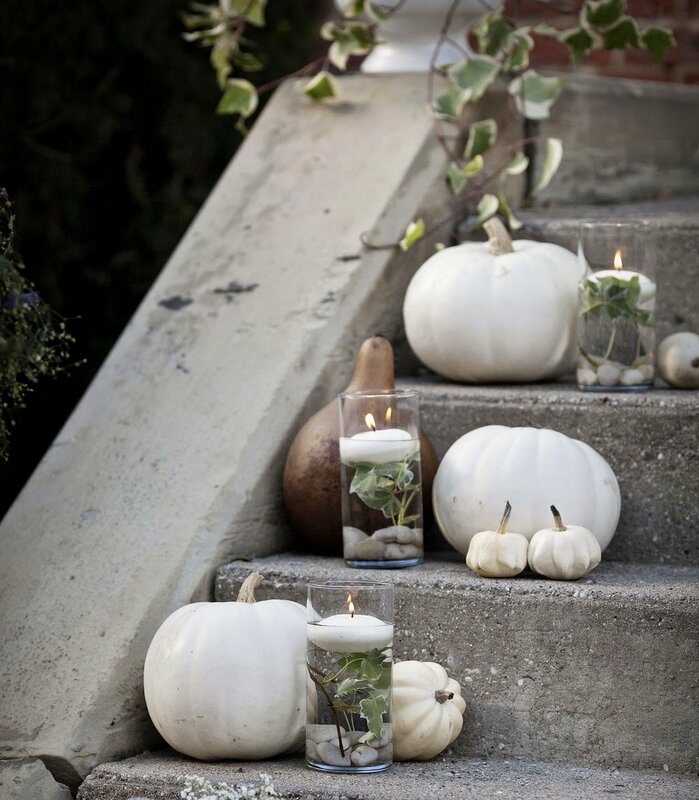 Use glass canisters for candles and for filling with more white pumpkins. Crate and Barrel sells a bag of 6 hand painted white pumpkins that work beautifully for liberally sprinkling pumpkins throughout an area.. add a set of their birch branches and you have a beautiful display that can also perfectly transition into Holiday decor. 5.) Choose a cozy corner, add your favorite basket and fill with pumpkins and subtle greenery. Opt for baskets that have an open weave or wire baskets so that you can really see through them. I love this one from the container store in copper! 6.) Simply pile 3 pumpkins on top of each other in 3 different sizes. Place by your front door, on a strategic spot on your floor or right on your table.. 7.) Place a small pumpkin on everyone's place setting. You can even arrange where everyone sits with name tags tied onto the stems! 8.) Create a quick centerpiece by putting a tray at the center of your dining table and placing various pumpkins, pinecones and greenery in it. 9.) For a softer and more minimalistic look, create a quick centerpiece by placing a few pumpkins amongst the greenery of a planter box. 10.) Create a linear display of pumpkins and foliage along your dining table runner. Its been about a month since school has started and every parent knows the morning madness when having little ones. Between waking them up, getting them dressed, and making sure you get them to class on time it can truly be a struggle. So, one way we can help with easing your morning routine is by providing you with some healthy on-the-go breakfast options that your little ones will be sure to love! As I’m sure most of you already know breakfast is the most important meal of our day; especially for our little learners whose brains require key nutrients in order for them to be focused and attentive! So here are 5 of my FAVORite quick, easy and nutritious breakfast ideas! Yes, you can finally let your little ones have pizza for breakfast with this healthier English muffin version! Absolutely, love this recipe and your little ones will too! Top one half of the English muffin with the sliced tomato and then shredded mozzarella. Place it on a baking sheet, along with the other half of the English muffin. Slide under the broiler. Broil until the cheese is melted and browned in places. Remove from the oven and add the fried egg, if desired, and the fresh basil. Top with the other half of the English muffin. The healthier alternative to pancakes and a fast way to feed the kids. Simply make a large batch of crepes, refrigerate or freeze then enjoy all week long! Blend all of the ingredients until completely incorporated (an immersion or regular blender works well for this). Let batter chill in the fridge for at least one hour. (This allows the bubbles to subside, making your batter nice and smooth.) Your batter can be made up to 48 hours in advance. Heat an 8"-10" non-stick pan over medium-high. Add butter to coat. Pour a scant 1/4 cup of batter into the center of the pan and swirl to spread evenly (you want a very thin even layer of batter—adjust amount of batter according to the size of pan you are using). Cook for 45 seconds and flip. Cook for another 20 seconds. Refrigerate any leftover crepes in a resealable plastic bag with a sheet of wax paper between each crepe to prevent sticking. Well-sealed, they can be frozen for up to one month! When you are ready for breakfast, kids can help fill their crepes with ham and cheese, fresh fruit and cream cheese, Nutella and bananas, peanut butter and jam or any combination that appeals. Roll up crepes like a burrito or fold in quarters to make a simple, portable meal. Sometimes kids refuse to eat anything at all in the morning, so one alternative I love is a smoothie! They are nutritious and refreshing for those warmer days. Add all ingredients to your blender and blend until completely smooth. *Optional: Add 1-2 Tbsp. of flax seeds to the blender for even more nutrition. Kids love conventional Pop-Tarts, but they aren’t the healthiest choice for breakfast. Instead, I love these homemade versions which contain less sugar and no artificial colors or flavors. Lightly butter both pieces of bread. Spread the jam over the butter onto just one piece of bread leaving 1/2 inch border around the edges. Top with the remaining slice of bread. Cut off the crust and seal the two pieces of bread together using the tines of a fork. Slide into the toaster; then *pop*, breakfast is ready. *Optional: Add thinly sliced fresh fruit such as bananas or strawberries for a fresh flavor. Try adding almond butter or organic cream cheese for an added boost of protein. Chocolate fiends could even try a teaspoon of organic chocolate hazelnut spread instead of butter. Leftover vegetables from last night’s dinner? No problem, we have the perfect solution for you: tortilla wraps! Place egg, cheese, avocado and tomato into the tortilla. Add last night’s veggies! Wrap as you would a burrito. Serve with fresh salsa if you wish. To see more amazing recipes be sure click here! Since summer is starting and my kids are no longer in school, I am constantly on the search for fun activities to do with them! Recently, I took a trip to Barnes & Noble and I was happy to find that they had an entire section dedicated to hand on activities that incorporated organic gardening, outdoor DIY’s, and more! There is a truly product for everyone. From 3 months, 18 months up to even 8 years old these activities are not limited to just one age group. Below I have included the links to each product so you can get more information on each one and shop them! Gardening Kit includes 6 packages of Heirloom Seeds, Starter Soil, Wooden Plant Stakes, Growing Instructions, Pencil & 100% Recycled Fiber Egg Carton Planter. Start your seeds indoors, in the egg carton planter, then transplant to a container in a sunny window or the patio. Seeds include: Roma Tomatoes, Jalapenos, Verde Tomatillos, Cilantro, Scallions, Beefsteak Tomatoes. Gardening Kit includes 6 packages of Heirloom Seeds, Starter Soil, Wooden Plant Stakes, Growing Instructions, Growing Journal, Craft Instructions on How to make a Flower Petal Kaleidoscope, Pencil & 100% Recycled Fiber Egg Carton Planter. Start your seeds indoors, in the egg carton planter, then transplant to a container in a sunny location. Seeds include butterfly loving nectar flowers: Rainbow Zinnias, Dwarf Yellow Sunflowers, Pink & White Cosmos, Red & Orange Nasturtiums, Blue Bachelor's Buttons, Lilliput Zinnias. The Creative Roots™ Paint your own Gnome. Kit has everything you need to paint and design your own Garden Gnome. The B. Illuminated Teepee is just beautiful as it lights up from within. Twinkle, twinkle little one. 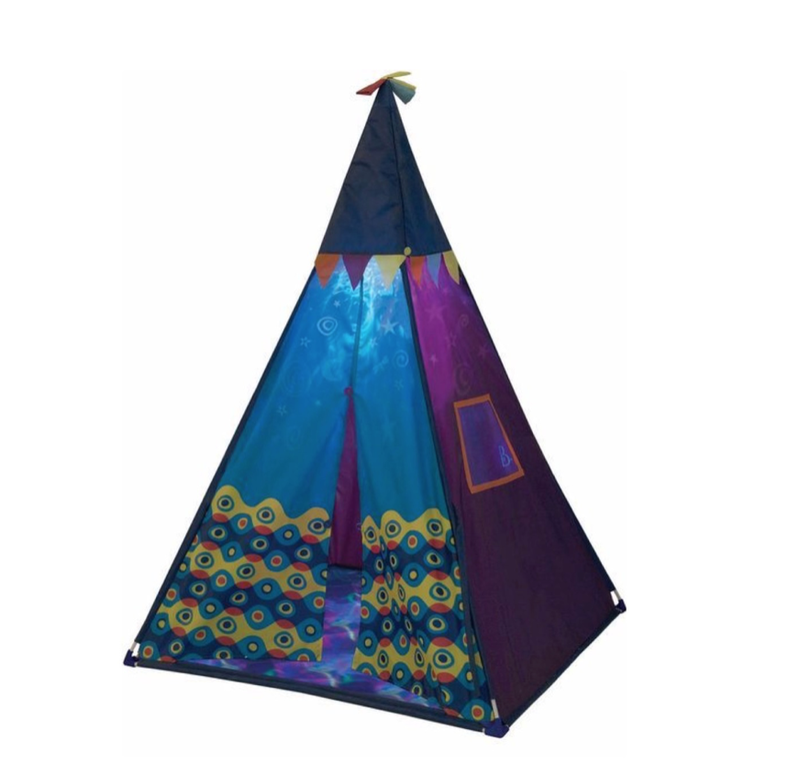 Your magical teepee adventures have just begun. Designed with gorgeous patterns and colors inspired by world travels. Once inside, pull the lantern's cord and discover a magical light show. Colorful stars are projected all around. Roomy enough for a few real friends or hundreds of imaginary ones! Eleven pieces - easy to assemble and easy to put away. Teepee's dimensions are 39.5" x 39.5" x 55". Learn about life cycles and decomposition using the experiments, fun facts, creative writing prompts and other activities in the included journal! Includes clear compost container with 2 compartments with removable divider, two 3x magnifiers, 2 write-on/wipe-off boards, and lid with air holes. Plant a little love and watch it grow! Chia seeds will sprout from this heart-shaped planter in just 3 to 4 days. • Includes chia seeds, potting mix, heart-shaped container and decorative foil accents. This all-weather stepping stone is ready to paint right out of the box, letting you skip messy cement-mixing and get right to the fun part: decorating and personalizing! A dozen vibrant paints allow for endless creativity-mix, blend and add custom color accents. Once painted, bake the stone in the oven for a long-lasting, weather-resistant finish. Each kit includes a cement stepping stone, 12 paints, a paint brush and instructions including a color planning template. This Classic Baby Beads rattle is brightly colored with non-toxic, water based finishes. The Classic Baby Beads are designed for tiny hands to handle, this vibrant bunch makes clinking noises when jumbled together. It is made from renewable rubberwood. I am always on the search to find new ways to enjoy time with my little ones. With summer quickly approaching one way we decided to spruce up our home is by making our very own terrarium! Making terrariums is a simple and easy way to add a beautiful piece to your home; plus, it’s a perfect opportunity to have fun with the family! Now here are the 5 Simple Steps! Step 1: Place the charcoal powder into the terrarium bowl until the bottom of the glass is covered and distributed evenly. Warning: Charcoal Powder STAINS fabric! Step 2: Place a layer of pebbles directly on top of the charcoal powder. This will create drainage opportunity when watering. Step 3: Distribute the soil mix between the pebbles until an even layer has formed at the surface of the bowl. Step 4: Place the desired succulents into the bowl. Make sure you combine the succulents soil, and the layer of soil well enough that it holds a firm grip! Step 5: Lastly, add one final layer of white accent pebbles (you can even use sand, black pebbles for a sleeker look, or whatever other color you prefer) between the plants. Make sure to be creative and have fun with it!